A Holga 120 medium format film camera only has two settings when it comes to aperture, the lens hole opening which impacts the lightness or darkness of an image. What are those settings, and how are they set? 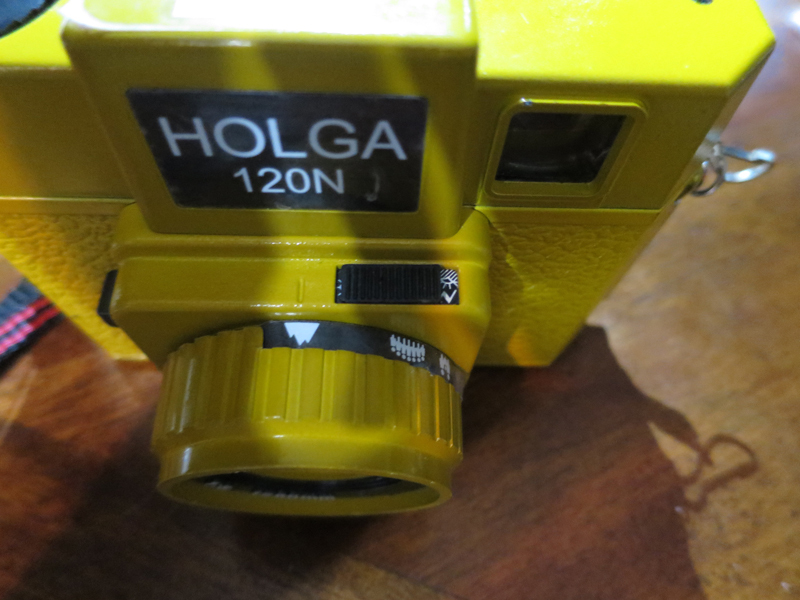 First, look at the front of your Holga camera, just above the lens area. You will see a sliding bar there. In one position, as above, it shows something slightly resembling a cloudy sky. If you slide to the other setting, you’ll see a sun. The Holga doesn’t work well in the dark. When I take dark / night images I generally have to use a long exposure and a tripod. So in general you’ve got one setting for sunny photos and another setting for medium-light photos. Those are your two options. If you play with that switch while the camera is empty of film, you should be able to see what it’s doing inside. For the sunny setting it lets in less light. For the cloudy setting it lets in more light. Technically speaking, the sunny setting is supposed to be about f/11. The cloudy setting is supposed to be f/8. Again, these are guidelines to play with and nothing set in stone. Or plastic. There are some Holgas where this switch does nothing at all. That’s what you get when you have an inexpensive plastic item that gets some wear and tear. So you have to do the best you can in the light you have. As with all Holga flim photography, it’s a good idea to keep a notebook with you and take notes each time you take a photo. What were the focus and light settings? What was the environment like? What were the results? The more you take notes, the better equipped you’ll be to use your camera well going forward.